In Timon of Athens, Lord Timon discovers the limits of wealth and friendship. He spends freely on others and hosts banquets for many guests. Despite his servants’ warnings, he spends so excessively that his money runs out—and the philosopher Apemantus condemns his flatterers as insincere. Soon Timon's creditors begin to call in their loans. Timon expects help from his friends, but they all refuse him money. Furious, he invites them again to a banquet, but serves only water and stones before he dismisses them, cursing Athens. He exiles himself to a wilderness. There the embittered Timon finds gold. He gives some to enemies of Athens and to prostitutes and bandits. When Senators beg him to return to Athens as a military leader to save the city from his banished friend Alcibiades, he refuses and retreats to a cave to die. Alcibiades defeats Athens but promises to protect the city and its citizens. Learning of the despairing inscription on Timon's tombstone, he repeats his offer of bringing peace to the city. 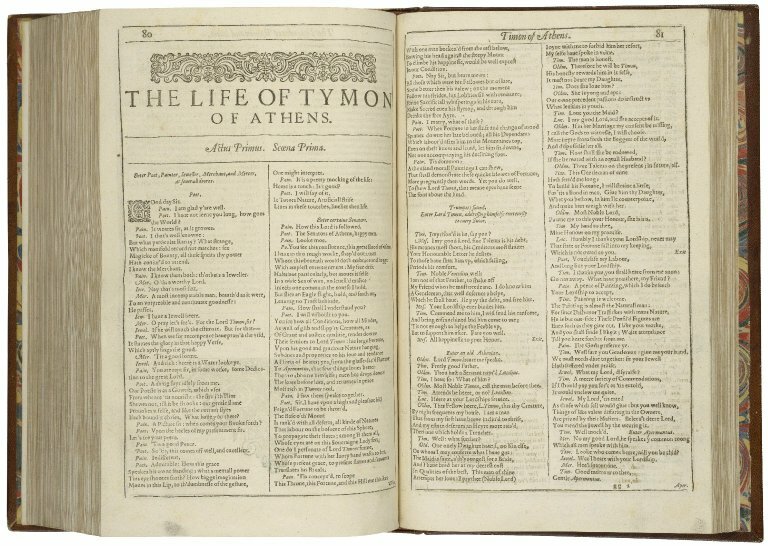 Timon of Athens was printed first in the 1623 First Folio, and that text is the source of all subsequent editions. As part of an NEH-funded project, the Folger digitized thousands of 18th-, 19th-, and early 20th-century images representing Shakespeare’s plays. Some of these images show actors in character, while others show the plays as if they were real-life events—telling the difference isn't always easy. 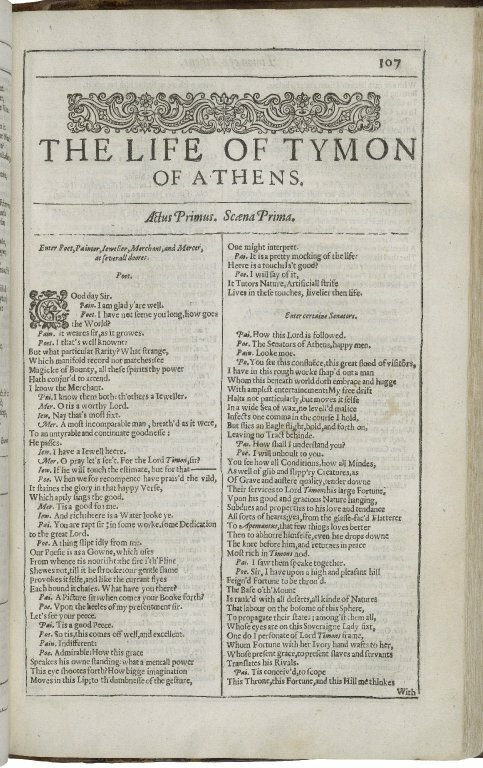 A selection of images related to Timon of Athens is shown below, with links to our digital image collection. 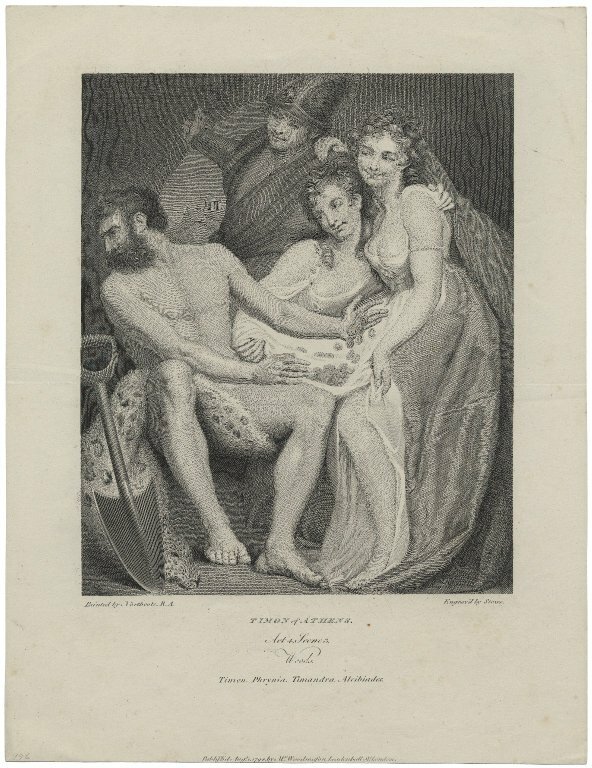 Timon of Athens, act 4, scene 3, Woods, Timon, Phrynia, Timandra, Alcibiades [graphic] / painted by Northcote, R.A. ; engrav'd by Stowe. Stow, James, b. ca. 1770, printmaker. London : Mr. Woodmason, Augt. 1, 1794. 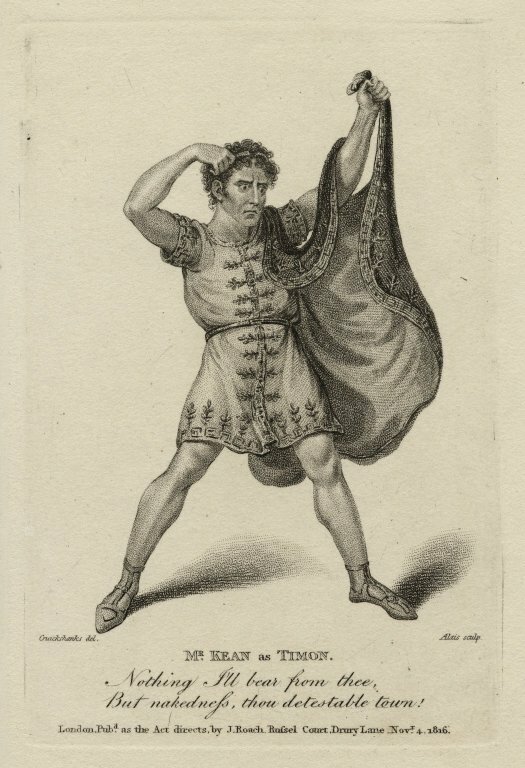 Mr. Kean as Timon [in Shakespeare's Timon of Athens] Nothing I'll bear from thee but nakedness, thou detestable town! [graphic] / Cruickshanks [sic], del. ; Alais, sculp. London : Pubd. by J. Roach, Russell Court, Drury Lane, Novr. 4, 1816. 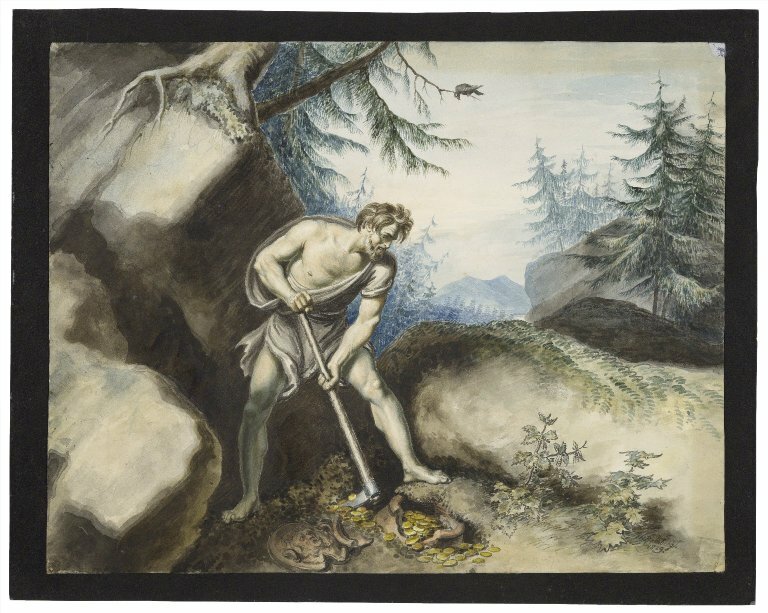 Timon of Athens, IV, 3, Timon laying aside the gold [graphic] / [Johann Heinrich Ramberg].